Situated at the end of the beautiful bay of Charaki, Argo taverna boasts some of the best views on the island. Surrounded by the sea you can relax and enjoy the sunset whilst indulging in some of the finest food to be found on the island. Argo truly is a special treat and we are privileged to be able to offer you such a unique venue accompanied with exquisite mouthwatering menus. The Argo is also perfect if you wish to arrive by boat from your ceremony location. This stunning venue is located on two levels. The pre-dinner drinks and evening entertainment are held in the al fresco lounge bar, where you will find comfortable seating and sea views. In the evening this lounge bar comes alive with a dance area and your choice of evening entertainment. The reception dinner is held on the spacious upper level, which is elevated into the mountain, giving you the most amazing 180 degree panoramic views across the bays of Vlicha, Kalathos and Haraki. In the early evening, as the sun sets behind the mountains, this venue offers the most beautiful blazing red skies. 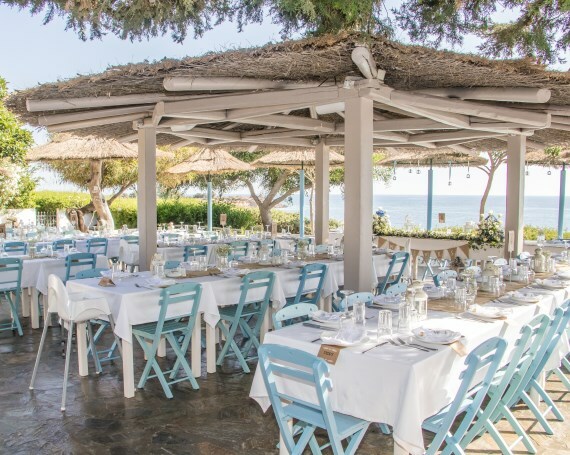 Mythos Restaurant is conveniently located in the main Lindos square, with views of the Acropolis and beach. 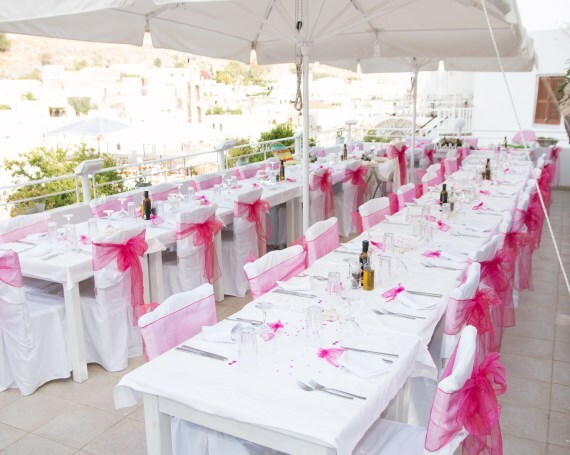 Your wedding reception will be held on the roof top garden area and you can sit back and enjoy the wonderful views .The restaurant can accommodate small wedding parties. Due to the restaurants location it is very accessible by car or coach. 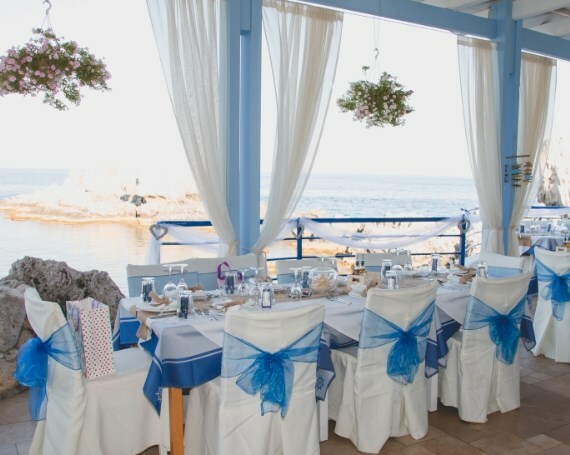 Mythos is very experienced in arranging weddings and events and has menus to suit all tastes or dietary requirements. Medeast we will do everything to make your celebration special, with a flexible approach to meet all your menu preferences and dietary needs. The menu is important to get right, but so is the atmosphere you want to create. 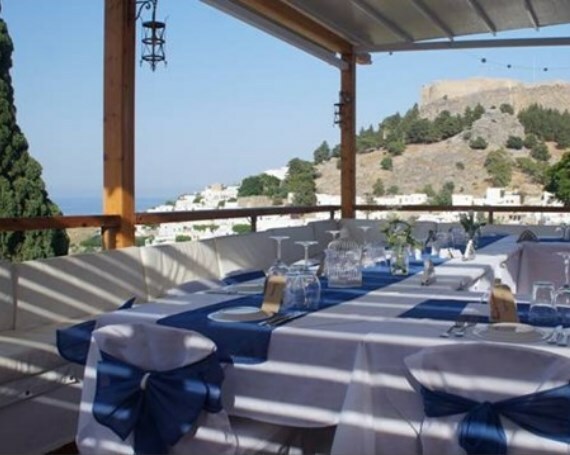 The restaurant boasts panoramic views of Lindos and the acropolis. They can also organise a pre-wedding family dinner, drinks party and canapés or both! The restaurant has space to dance if you want, the bar is inside providing a cozy atmosphere to enjoy the evening. Skala Beach taverna in Lindos was built as fishermen’s store and it was converted into one of the most popular tavernas in Lindos by the owner, Sotiris Diakoulas. The taverna has amazing views of the Acropolis and Lindos bay. 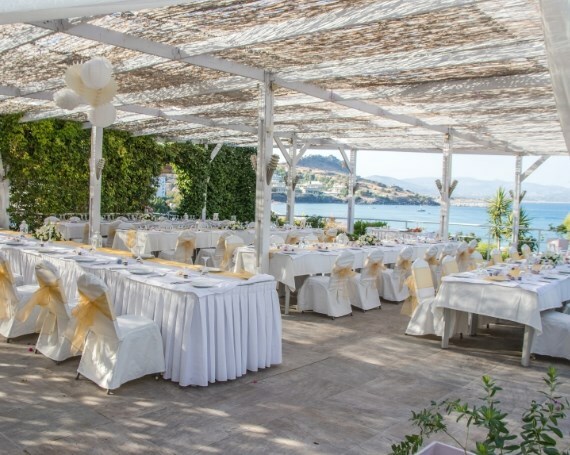 Sotiris and his staff are extremely experienced in arranging wedding receptions and events and will give you a warm arrival. The house itself was probably built during the 17th century. It has wonderful views of Lindos village and the Acropolis. 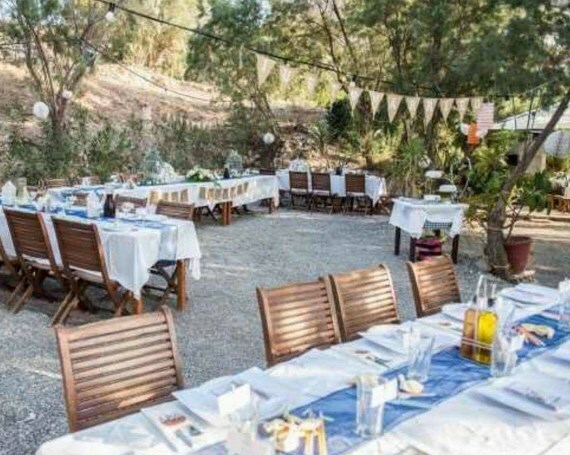 The owners are extremely friendly and are wonderful hosts for your Lindos wedding reception. They offer exquisite menus and wine at affordable prices. The Kalypso have been successfully arranging wedding receptions for years and you will be guaranteed a wonderful evening. A little gem set on the beach in the heart of St Paul’s bay facing the chapel. The cuisine is of a very high standard, as is the service. It is probably the only restaurant with tables on the sand so you can kick off your heels and relax after your wedding. A unique restaurant sitting above Pefkos beach boasting amazing views on the bay. Philosophia is an extremely popular restaurant. 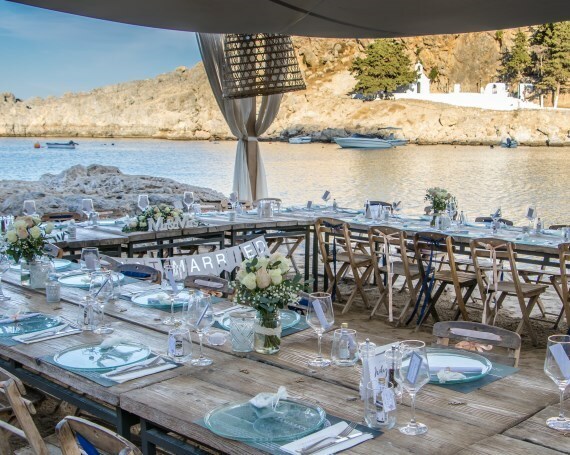 If you wish to hold your reception here you need to book up quickly - the food and the views make this a winning choice for your Lindos wedding reception. 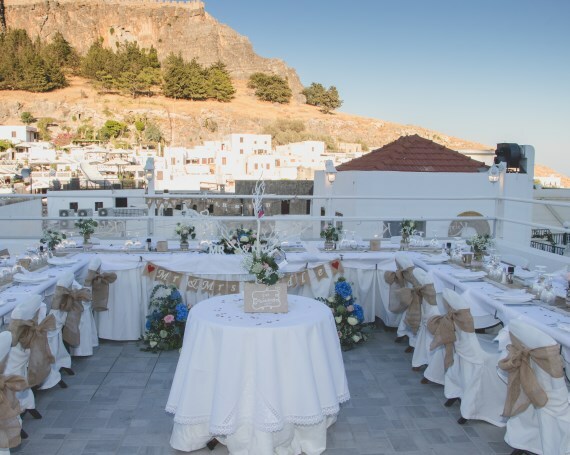 We also offer additional wedding reception venues in Lindos, please download our Lindos reception venues brochure or contact us with your requirements and we'll be happy to suggest the prefect venue.